For almost four decades, Ashoka’s core work has been promoting positive social change. The everyone a changemaker world that Ashoka envisions is one where everyone has the skills and awareness to be a changemaker for the good of all. Ashoka seeks to ensure that we practice this vision in our workplace. For this reason, we take immediate action if and when any allegations are made against our organization or its employees. Ashoka is committed to providing a safe, healthy, and respectful work environment that is free of harassment or discrimination of any kind. We will remain vigilant to ensure that our workplace is defined by respect, integrity, and the sanctity of goodwill. Any actions at work or outside of work that Ashoka determines to be a threat to the well-being of the Ashoka community or any of its members, as well as actions that negatively impact Ashoka’s interests, will, therefore, result in an appropriate and immediate disciplinary response. Allegations of harassment, discrimination, or retaliation will be promptly, thoroughly, and impartially investigated, if appropriate, with the support of outside, expert counsel. Ashoka will maintain confidentiality and offer support throughout the investigatory process to the maximum extent possible and take appropriate corrective action if necessary. 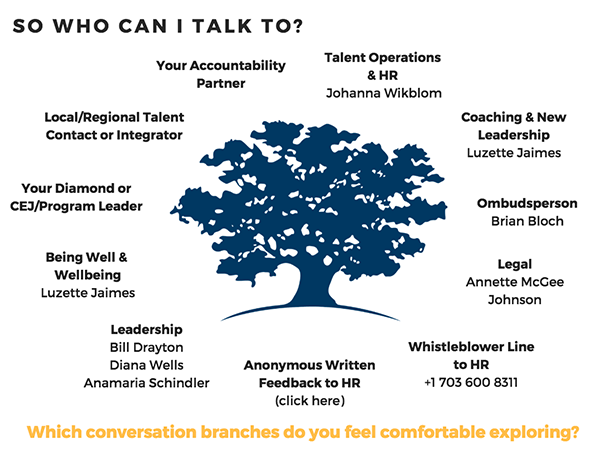 Employees or members of Ashoka’s network who believe they have experienced or have become aware of any incident of harassment, discrimination, or retaliation are encouraged to report the conduct to the HR Director (HR@ashoka.org) or through our Whistleblower Hotline +17036008311. In addition to reporting, Ashoka encourages individuals who are comfortable doing so to promptly give direct feedback to the individual whose behavior is a the cause for concern, clarifying that it is unwelcome and must stop. This action alone may resolve the problem and support a culture in line with our values — one where we all help each other to succeed.